Chook & Sosig: Walk the Plank – Good friends and tabletop mayhem. Gather 'round for point-and-click piracy. A spaghetti-limbed cat and a spectral chicken... seems like a match made in best friend heaven, doesn't it? They're about to sit down for a round of pirate themed tabletop gaming, and they've saved you a seat. Join former child star Sosig and their ghostly poultry pal Chook for game night along with some of their weirdest and wonderful-est buddies in this point-and-click adventure by TookiPalooki. A game brought to life by the distinctive, colorful stylings of veteran artist TookiPalooki. Play a game within a game as you guide Sosig on a pirate-themed adventure with their friends. Explore a game filled with humor and warmth, and lovable oddballs to hang out with. As the game opens, Sosig is sitting down for their very first tabletop adventure. They're about to play a game of pirates together, and all their friends are eager to share their ideas for the perfect game... no matter how many roles they have to play, or what their long-suffering DM Exley wants. You'll guide Sosig as they bounce from the real world tabletop-side to a lush world of pirate adventure inside Exley's story. After acquiring a ship, you'll sail from island to island, solving puzzles and helping out your friends... who are each playing multiple characters to move the story along. (Mermaid princess Hebble, anyone?) With multiple potential endings to chase down, Sosig's adventures are just getting started. 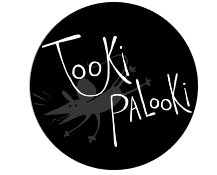 TookiPalooki is a one-woman indie game development studio. Her games are inspired by the quirkiness in nature, as well as cartoons, skeletons and other critters.